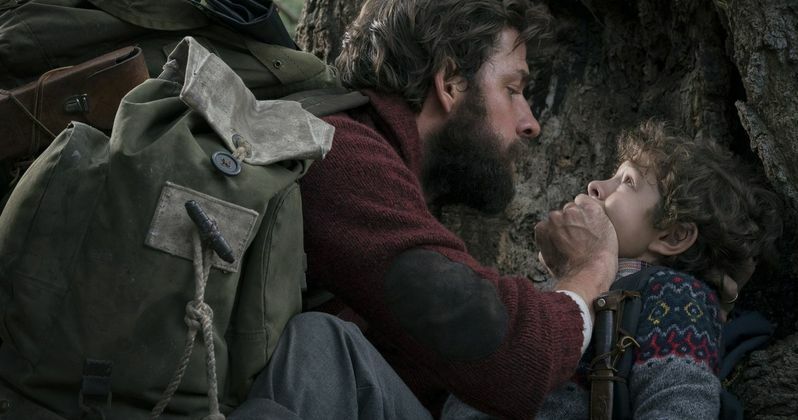 Paramount Pictures has released a terrifying new trailer for A Quiet Place. It's difficult to break new ground in the realm of mainstream horror these days, but Paramount Pictures may have something pretty unique with A Quiet Place. The movie centers on a family who has to remain dead silent in a post-apocalyptic world in order to avoid encounters with some mysterious monsters who are lurking just around the corner. This new trailer gives us a better idea of just how scary these monsters are and gives us a slightly better idea of what to expect, in terms of story. The studio is keeping a pretty tight lid on this one and all of the footage we've seen so far is really mysterious. However, this trailer opens up with footage of Emily Blunt's character watching a news report on a disastrous event wiping a whole lot of life from the face of the Earth. Blunt and her real-life husband John Krasinski, who also directs A Quiet Place, are doing everything to protect their children in the aftermath. In order to do so, they must live a silent existence. But as we see in the trailer, that's easier said than done. This new footage expands upon the TV spot that Paramount debuted during the Super Bowl. This new trailer paints A Quiet Place as an incredibly tense horror/thriller and it looks like they're not really going to let us see the mysterious monsters in their entirety until the movie arrives in theaters on April 6. Though, some lucky SXSW attendees will get to see it early, as the movie is scheduled to open this year's edition of the festival in Austin, Texas on March 9. So we'll be getting some reactions to the movie in a little under a month. John Krasinski is best known for playing Jim on The Office, but he does have some previous experience directing. Though, this is easily his most high-profile feature to date. He also helmed 2009's Brief Interviews with Hideous Men and 2016's The Hollars. This also marks the first time that Krasinski and Emily Blunt have starred in a movie together. The cast also includes Noah Jupe, Millicent Simmonds, Evangelina Cavoli and Cade Woodward. The movie was originally written by Bryan Woods and Scott Beck, with Krasinski doing a rewrite. 2017 was a banner year for horror movies and this looks like the kind of movie that could help make this year be just as special. So far, everything looks good. The trailers are intense, the movie is anchored with a pair of very strong leads and Paramount seems to have a lot of faith in it. And they're a studio that could really use a hit right now. Let's just hope it lives up to its potential when the movie is released. Be sure to check out the new trailer for A Quiet Place, courtesy of the Paramount Pictures Indonesia YouTube channel, for yourself below.